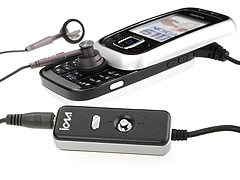 iDNA Remote For Nokia Phones | OhGizmo! By this point, it’s probably better to just give up bitching about the fact that every company out there is trying to cash on the “iSomething” nomenclature. So, just ignore the dorky name on this one: iDNA. What the device does, on the other hand, is quite handy. If you’re the proud owner of a Nokia 6111, 6230i, 6270, 6280 or 7360, you now have the option of listening to your music through a set of regular headphones. The iDNA is a remote control that plugs into your phone’s Pop Port on one end, and into any ole set of headphones on the other, by way of its 3.5mm jack. The controls on the remote itself allow you to do all common operations, like pause, rewind and such. Should you get a call, it interrupts the music, and the integrated microphone allows you to use the setup as a headset. Goes for $45 without an earpiece, or $48 with.